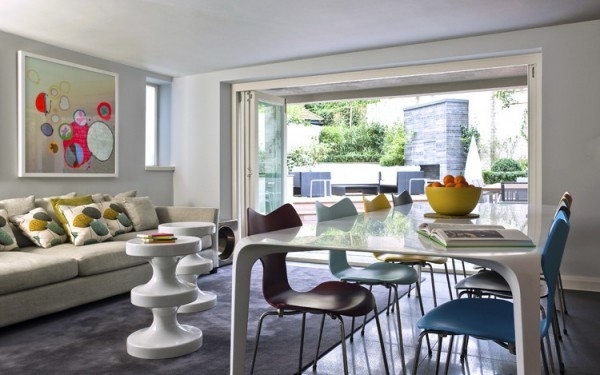 SHH’s client – an international family with a suite of homes (including one in New York and one in continental Europe) – purchased the four-storey property and appointed SHH both as interior architect and designer/decorator to re-plan and redesign the interior to fit their specific wants and needs. The overall brief for the interior was non-prescriptive in terms of detail, but was more about feel. 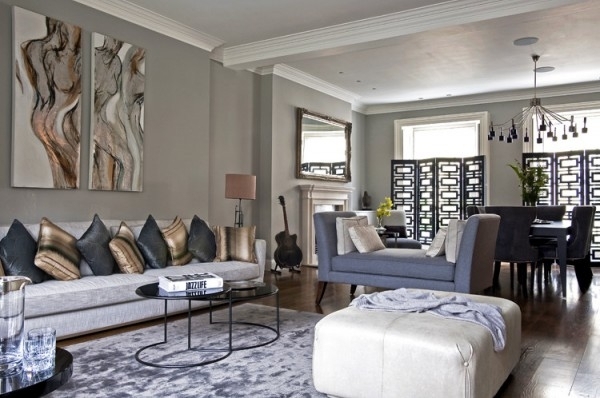 The client asked for a classic and sophisticated series of spaces in muted grey tones. As the client didn’t like curtains, wall coverings or finishes such as polished plaster, we had to look for ways to add an element of glamour to the requested cool, calm and classic approach, so that the space also had variety, drama and a sensual richness. The lower-ground floor interior is made up of an open kitchen and informal living and dining space, along with a toilet, utility room and existing stair to the ground floor in exposed concrete. 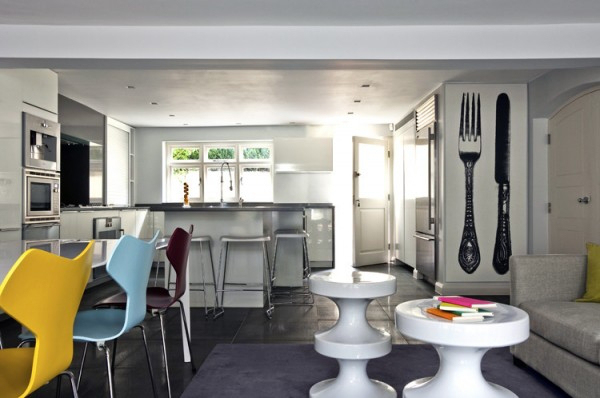 The kitchen is by Poggenpohl with a 2.5m long ‘Link’ dining table by Jakob Wagner and six brightly-coloured Arne Jacobsen ‘Grand Prix’ chairs, along with platinum-enamelled ceramic ‘Ringo’ side tables and three feature ‘Bishop’ stools in white and black ceramic, all by India Mahdavi of Paris. We introduced white and black elements throughout, in order to add a touch of high-contrast glamour to the otherwise subtle and subdued colour scheme. Behind the dining table is a custom-made feature oak veneer wall (by Interior Joinery), hand-etched with a bespoke designed (by Susan Knof) floral pattern with open recessed side bookshelves, allowing for both open and hidden storage and the concealment of AV equipment, with concealed lighting below the ‘floating’ wall and on each shelf. A long sofa, upholstered in a J. Robert Scott fabric (with Sanderson ‘dandelion clock’ cushions), stands in front of a vibrant artwork, chosen jointly for the space with the client. 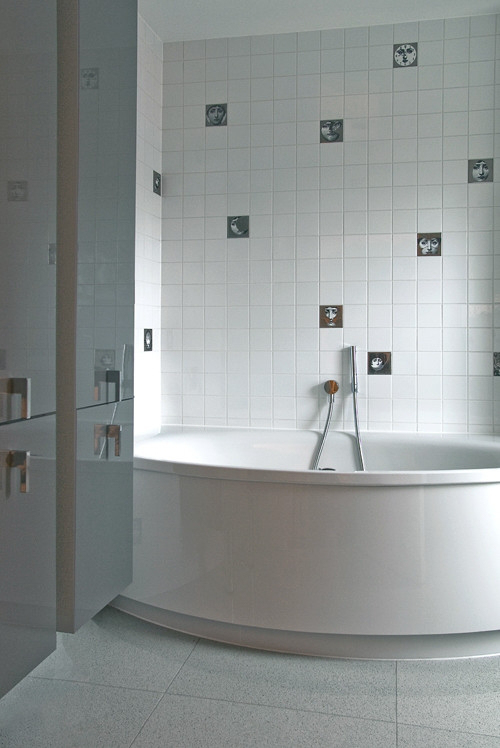 A lower ground toilet is decorated in dark grey glass mosaic tiles. The main entrance to the house is via the raised ground floor, which houses an entrance hallway, guest cloakroom and a large formal reception, dining and living area which extends across the whole length of the first storey. 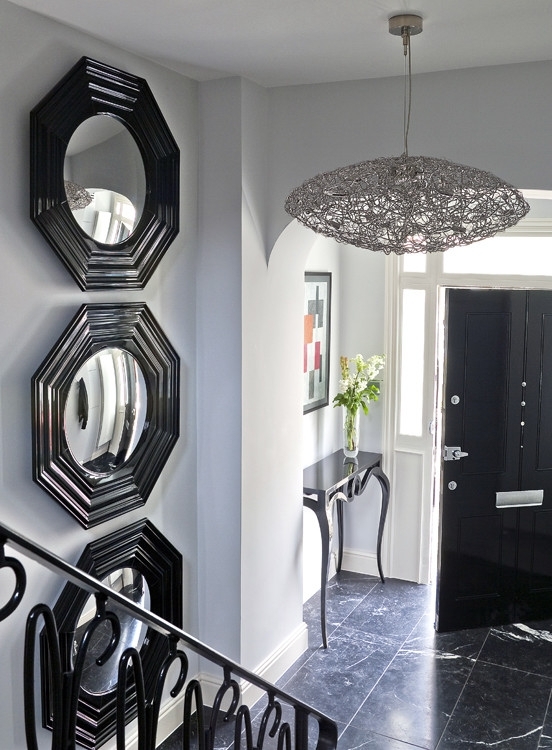 The hallway features a black-lacquered entrance console table by Christopher Guy, made to bespoke dimensions for the project, and a series of three high-gloss, black-lacquered and bevelled convex Lennox mirrors from Boca Do Lobo. A large-scale, free-formed nickel chandelier by Brand Van Egmond illuminates the space, whilst the artwork on the wall in this space is the client’s own. An existing stair has been refurbished leading up to the first floor with new timber treads and a bespoke wrought iron handrail, designed by Susan Knof. Flooring is in large-format panels of black fumed oak. The full-length reception, dining and living space is entered via a grand double door (bolection-molded) in dark charcoal grey-tinted wood. The formal dining area is at the front of the space, delineated by bespoke folding screens with matt lacquered fretwork panels and sheer ‘Dedar’ fabric inlay, offering privacy from the street whilst ensuring that natural light is not prevented from entering the room. To the side of the table sits a neo-classical cabinet with a mirrored and black-lacquered chest containing three centrally-positioned doors, by Christopher Guy, with a large-scale metal wire vase on top. The master bedroom suite occupies the whole of the first floor level, with two spaces connected or separated by a sliding door. A custom-designed daybed sits in the window alcove and can convert into a guest bed when needed, but the real function of the space is a walk-in wardrobe, with off-white satin lacquer joinery (which also conceals the aircon units) and classic vintage 1940s Italian furniture (stool and side tables) purchased by the client and designer together from the Battersea Art & Antiques Fair. The room also features a custom-made ottoman upholstered in zebra printed hair on hide. The master bedroom has the high-end feel of a luxury hotel suite. The wallcovering is a subtle, tonal hounds tooth patterned paper (by Brian Yates) and the bed has a bespoke headboard in 100% lambs’ wool in graphite grey with soft button details, as well as a throw in a subtle multi-toned cream zebra print pattern. The cushions are french-pleated, 100% Patagonian fog wool flannel fabric by Holland and Sherry. Cushions are a varied mix of mohair, silk and cotton. A side chair in the room is a ‘Mirandolina’ chair by the Italian manufacturer Giovanetti, whilst a further blind hem-edged art silk rug completes the fabrics for the room. The room also features new bespoke joinery units (again concealing plumbing, AV and mechanicals) in cream and a matt satin dark chocolate-brown lacquer (to add a masculine note to the space), with subtly-engraved door and drawer fronts featuring custom door ironmongery from PE Guerin in New York, including styled antiqued silver drawer knobs and pulls ranging from Louis XV style to a modern octagonal knob. The unit houses a television, and also wraps around into the master bathroom behind, where it is covered in textured Dechierier tiling by Patricia Urquiola. 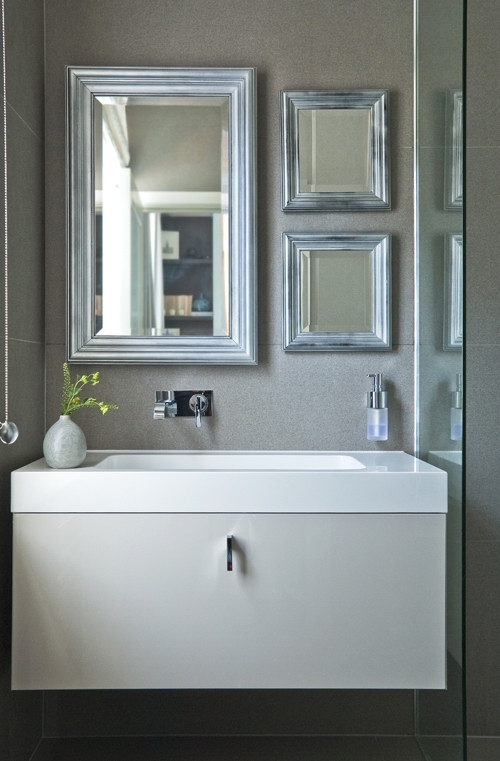 A wall was knocked down to create the perfect master bathroom, which boasts a silver metallic Artquitect vanity unit and basin in a white lacquered setting, plus linen cabinet and mirror, all by Jaime Hyon. On the second storey, a child’s bedroom both fits with the rest of the house in terms of subtle tones, but is also animated and fun and very much allowed to be a proper children’s room. Wall coverings are a tonal polka dot paper with a feature wall using a bird pattern paper, with Ed Annick ‘Snijder’bird mirrors overlaid on the same wall. Extra decoration takes the form of a 100% wool sheared and sculpted sculptural, floral-patterned circular rug and over-scaled floor cushions in various fabrics. The accompanying bathroom is also playful but not too full-on, allowing for the child to grow up and still enjoy the space. 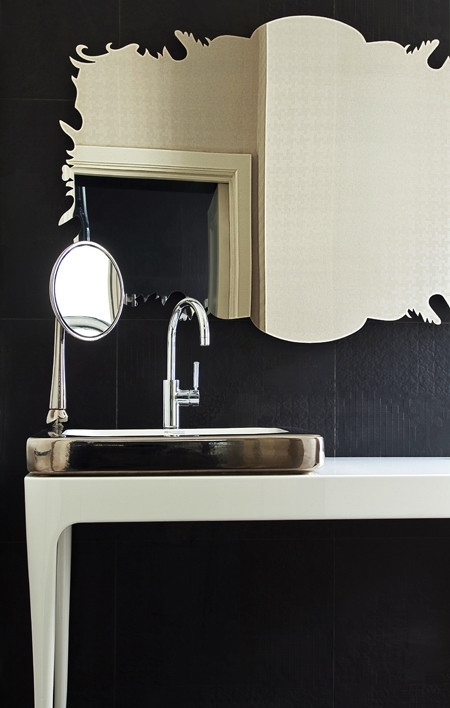 Features include Fornasetti ‘face’ tiles, polished chrome Zuchetti basin taps and a Marcel Wanders mirror. There is also a guest suite on this floor. The guest room has a slightly different colour palette in an array of blues, greys and silvers, including a bespoke scalloped headboard with a textured, perforated pattern and a dark walnut timber bookcase, whilst the guest bathroom, in soft, multi-toned and multi-textured tiling, has a larger concealed vanity unit with a storage drawer, a concealed medicine cabinet and custom-made, framed, bevelled-mirror fronts in a silver washed finish. The final 2nd storey space is a study, featuring two Tom Dixon suspension pendant lights with concealed wiring in a bespoke joinery detail and leather-wrapped drawer pulls with an exposed top-stitch detail. 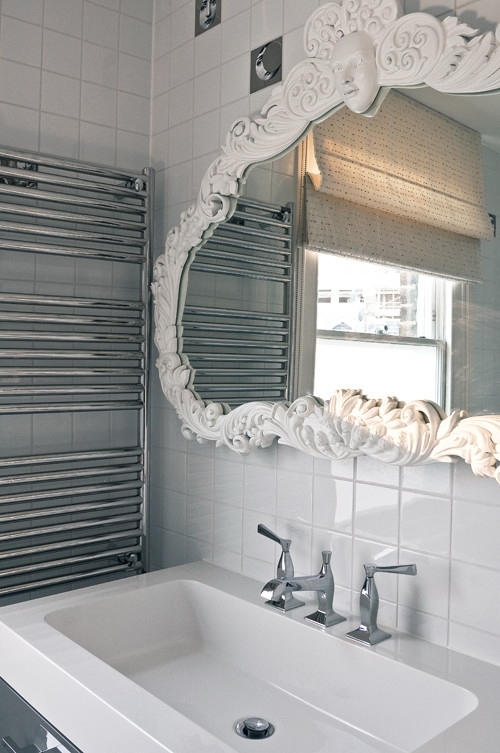 Susan Knof is a Senior Interior Designer at multi-award-winning, London-based architects and designers SHH, specialising in the interior design, decoration and styling of high-end residential projects. The American-born designer joined SHH in 2007, having both lived and worked in New York, Sydney and London, which lends a sophisticated and cosmopolitan style to her designs. For inspiration, Susan looks to travel, music, fashion, jewellery, literature and architecture and loves both the culture and vibrant pace of city life and the calm of natural landscapes. She is a great believer in the transformative power of colour and its ability to create or enhance the mood of a given space for its end users. Susan studied design at Miami University and textiles and photography at the University of New South Wales, going on to work as an Interior Designer for practices such as Gensler and SOSH Architects in New York. She is also LEED-accredited (Leadership in Energy and Environmental Design) and took time out early in her career to work on projects for the ‘Habitat for Humanity International’ in mainland America and in Hawaii. Project work in Susan’s portolfio has ranged from leisure centres, offices, casinos and hotels, but luxury housing has always been a major focus. At SHH, Susan has worked on interiors for London townhouses, Moscow villas and Lisbon penthouses in a variety of styles, from classic, modernist, and minimalist to maximalist, but always with the extraordinary level of finishes and bespoke solutions that characterises SHH’s work in this market.